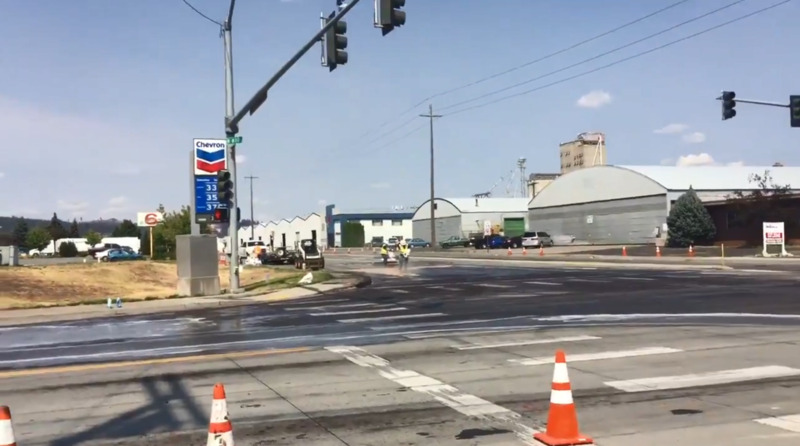 A leaky trailer full of grease turned a busy intersection into a messy, smelly slip ‘n’ slide Tuesday, forcing the closure of parts of Broadway Avenue and Fancher Road in Spokane Valley. Spokane County sheriff’s deputies said a faulty hatch on a semitrailer was to blame for gallons of the soupy animal fat falling on the roadway at about 9:30 a.m. Tuesday. The semi driver apparently noticed the spill quickly and pulled over, but the cars coming after didn’t. Gregory said drivers continued to spread the slick substance in all directions, leading road crews to close Fancher from Desmet Avenue to Alki Avenue, and Broadway from Lake Road to Howe Road. Crews continued to put material on the spillage Tuesday afternoon. Gregory estimated the closure could remain in effect until as late as Wednesday morning. The driver of the semi was issued a citation for driving with an unsecured load, and he or his employer could end up incurring the cost of cleanup, Gregory said. Published: Aug. 28, 2018, 4:35 p.m. Updated: Aug. 28, 2018, 6:08 p.m.